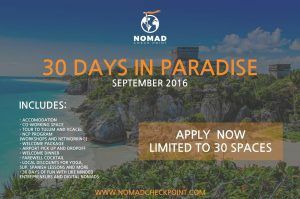 Nomad Check Point organizes and runs 30 day retreats for digital nomads and entrepreneurs in Mexico and Latin America. Join a community of entrepreneurs, digital nomads and freelancers for a 30 day experience of co-living and co-working and take your business to a new level. They have some month retreat in Mexico, Chile and Peru.